Feet provide support for the rest of your body. A common foot problem for people with high arches is that their feet are stiff and unable to properly absorb the shock of walking and running. The opposite problem is when someone has flat arches and has too much flexibility in their foot. This can cause ankle and knee problems as well as lead to several different foot conditions such as plantar fasciitis. I used to work long hours on my feet and currently cannot walk barefoot without foot and knee pain. I received a pair of OOfos Mocha Thong Sandals for a review last week and have been very pleased to find a sandal that is so comfortable. OOFOS uses a revolutionary material called OOfoam that absorbs the shock from walking. When compared to the material EVA, OOfoam is 37% more impact absorbing. Although the sandals are very soft under your feet, they support different foot types and provide arch support. They actually remind me of the special mats people often use when standing for long periods of time. They are also very lightweight and machine washable. OOFOS are available for both men and women and come in two styles: thong and slides. Each style is available in fuschia, tangerine, mocha, and black. If you would like to “feel the OO,” you can purhcase OOFOS sandals at the Insole Store. To learn more about OOFOS, you can also visit their website at www.oofos.com. OOFOS Thong Sandals – Women’s Black, Mocha, Fuschia, or Tangerine. 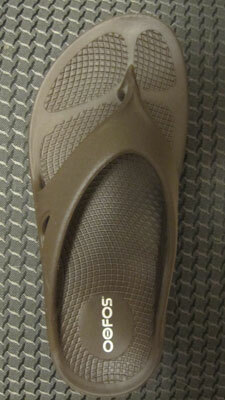 Our Virginia Home received sandals from OOFOS for a product review. However, only our honest opinions were expressed. football type running in place. Standing and shopping all day. Since I’ve had surgery on my right ankle, walking any distance hurts my feet. Finding appropriate shoes is extremely difficult. Walking all day hurts my feet! Any activity can hurt my feet and back, but I would say the worst would be when I have to stand in one place. Long walks hurt my feet. Running long distances hurt my feet. Walking a lot or standing for long periods of time. Long walk in shoes that don’t have padded insoles. Running long distances and standing in the same place for a long period of time is the worst! Standing or walking a lot will make my feet hurt. I have an injury to my left foot so most activities cause pain. sitting on an airplane for too long makes my feet ache and swell.